A column attached to an X-style base. It’s time. You have received all your furniture, unwrapped it all, and made sure that you have everything that you need. Now it is time to tackle the assembly. One of the most daunting tasks can be assembling table tops and table bases. Don’t worry, attaching a table base and a table top is easier than you might think. 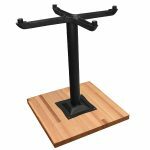 The first step, whether you are assembling an indoor or an outdoor table base, is to take the bottom of the base and attach it to the column. To do this, simply place the column on top of the center of the base and screw the bolt in until it is completely tightened. Next, turn your table top upside down on a flat surface. If you have a single base you will then center the spider. The spider is the smaller, usually square, flat part of the base. Once you have the spider centered onto the table, begin screwing in your eight screws until the top is secure. Each base comes with eight screws per spider. To install this you will need a Philips head screw driver or drill bit. Purchasing a larger table top might require the use of multiple bases or a double base. You will repeat the process but instead of centering the spider, the bases need to be between 6 to 12 inches from the edge of the table top. This process works for table tops on both table height and bar height bases. A table top placed on the floor with a base centered over the table top ready to be securely screwed in. If you are assembling an outdoor table top and base, there are a few adjustments you’ll need to make. 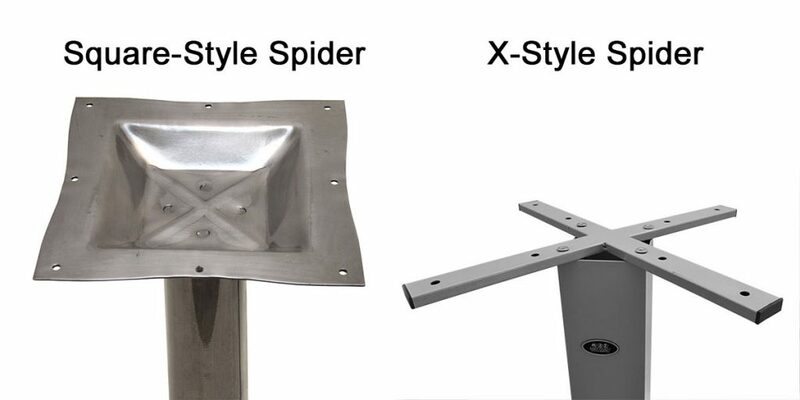 First off, most spiders for outdoor tops are an x-shape. (insert picture) Once the column is assembled, place the spider onto a table top that has been turned upside down on a flat surface. With our New England collection, the table is attached using an Alan wrench is provided in your shipment. The table might have pre-drilled holes that your base lines up with and that you can use to attach the base. Some bases may not line up with the holes depending on your top and base combo. If this is the case, you will have been provided self-tapping screws to allow you to create your own holes. Make sure the base and table top are completely secure before use. These instructions are based upon the furniture produced by East Coast Chair & Barstool. If you have purchased your commercial furniture elsewhere instructions may vary. 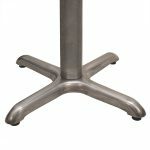 If you are still experiencing issues with attaching your bases and table tops purchased from East Coast Chair & Barstool please contact our service department at 800-986-5352 for help.